8/9/08 — Acquisitions — Ecouen, Musée national de la Renaissance — The château of Ecouen has just benefited from a donation granted by Axa of a national treasure, a stoneware pavement from the château of Polisy in the Aube (ill. 1). This acquisition was purchased from the J. Kugel Gallery in Paris for 2.25 million €. Polisy is a major Renaissance landmark, built between 1537 and 1544 by the Dinteville family. The honours hall on the upper story had a floor covered by a large stoneware pavement, the same one which has just entered the Ecouen collections, and, until the end of the 18th century, also contained The Ambassadors by Holbein, which today is at the National Gallery in London. After its remodelling in the 18th and 19th centuries it was never listed as a Monument historique due to the owner’s refusal. About thirty years ago , the pavement was taken up and sold to a collector but remained in storage. In 1992, as if that weren’t enough, the château was ravaged by a fire leaving it almost in ruins. The pavement is made up of tiles measuring 15 cm. on each side, in good condition. The motif takes its inspiration from the Serlio models, and it is thought that he worked at the château de Polisy. The craftsman is in any case unknown and it was definitely not, Masséot Abaquesne, the stoneware artisan active in Rouen from 1524 to 1557 to whom it had been previously attributed and who worked at Ecouen . 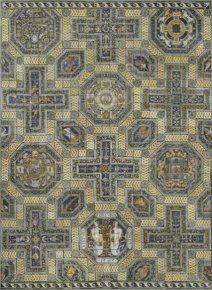 The same workshop probably produced the pavement for the chapel of Sainte-Croix in the Langres cathedral in 1551 . The reconstitution of the pavement in one of the halls in the château d’Ecouen (ill. 2) was carried out following the motifs and in the most probable manner, taking into consideration a partial account which had been published in 1861[See the very good catalogue of the exhibition held at Bourg-en-Bresse in 2000 : Images du pouvoir. Pavements de faïence en France du XIIIe au XVIIe siècle, Editions de la Réunion des Musées Nationaux, 2000, p. 154-155. We have borrowed some of the information provided there for this article.]]. Here and there, some tiles look as if they probably come from somewhere else, but the overall result is indeed an accurate rendering. The shield held up by the two sirens is that of the Dinteville family (ill. 3). 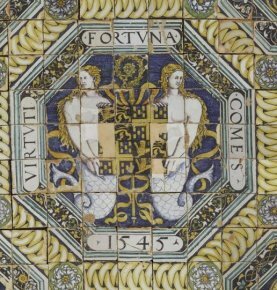 The motto Virtuti fortuna comes and the presence of the mitre confirm that the patron was François de Dinteville, bishop of Auxerre. Other elements which did not belong in the ensemble will be preserved elsewhere and may be lent for exhibitions. Thanks to this patronage, Ecouen has gained a particularly rare masterpiece of major importance which will be put on view for the public starting 20 September 2008. There is another recent acquisition which should also be pointed out, a Flemish Romanist painting, purchased from Michel Descours, an art dealer in Lyon, representing The Devotion of Marcus Curtius (ill. 4). 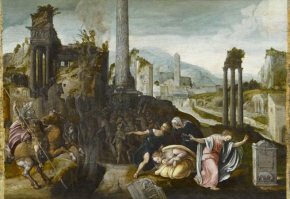 This panel, of extremely fine quality, is close to the art of Martin van Heemskerck, even if his name is for the moment mentioned with great caution. The date varies : if one accepts the study on the restoration of the reclining statue of Louise de Coligny on the DRAC Champagne-Ardennes website which mentions the château de Polisy, the pavement was still there in 1985. 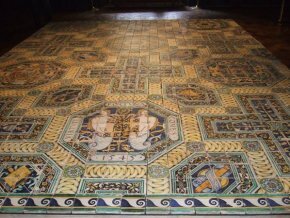 The château still has some of the tiles which decorated the whole first floor, from Masséot Abaquesne’s workshop. The original tiles are for the most part held at the Musée de Langres.